President Obama has called income inequality and lack of upward mobility “the defining challenge of our time,” while New York Mayor Bill de Blasio won a landslide victory last November with a campaign addressing a “Tale of Two Cities” in which the gulf between the very rich and the very poor continues to grow. Using an economic yard stick or ratio to measure the gap between households that just crack the top 5 percent by income and those that just fall into the bottom 20 percent, this overall ratio of disparity across the 50 largest cities grew by just eight-tenths of a percent between 2007 and 2012 – from 10.0 to 10.8. What’s more, the new study written by Alan Berube and released on Thursday found that inequality is sharply higher in economically vibrant cities like New York and San Francisco than in less dynamic ones like Columbus, Ohio, and Wichita, Kansas. In other words, the most economically equal communities are often the ones struggling the most to recover from the recession, while the greatest disparities can be found in economically high-flying cities and regions. The latest U.S. Census Bureau data confirm that overall big cities remain more unequal places by income than the rest of the country, according to the Brookings report. Across the 50 largest cities in 2012, the “95/20” ratio of income disparity between the very rich and very poor was 10.8, compared to 9.1 for the country as a whole. The higher level of inequality in big cities reflects that big-city rich households are somewhat richer ($196,000 versus $192,000), and big-city poor households are somewhat poorer ($18,100 versus $21,000) compared to national averages. “However, some cities are much more unequal than others,” the study states. 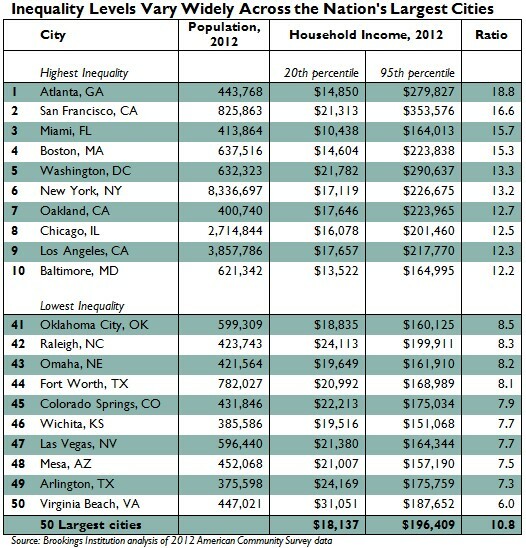 The big cities with the highest 95/20 ratios in 2012 were Atlanta, San Francisco, Miami, and Boston. In each of these cities, a household at the 95th percentile of the income distribution earned at least 15 times the income of a household at the 20th percentile. In Atlanta, the richest 5 percent of households earned more than $280,000, while the poorest 20 percent earned less than $15,000, the report states. In another six cities (Washington, D.C., New York, Oakland, Chicago, Los Angeles, and Baltimore), the 95/20 ratio exceeded 12. Overall, 31 of the 50 largest U.S. cities exhibited a higher level of income inequality than the national average. Only 18 other cities among the top 50 registered statistically significant increases in their inequality ratios over those five years. Most were not places where the rich made astronomical gains, but where low-income households suffered most from the recession and weak recovery. Many of those cities are in the South and West--including Sacramento, Charlotte, Tucson, Fresno, and Albuquerque—where house-price collapses reduced work opportunities for poor households. Inequality was also up in places like Cleveland, Indianapolis, and Milwaukee, where poverty deepened as local manufacturing industries declined during the recession. In those cities, the study notes, inequality has not become a leading political issue. The study was released at a time when Obama and a number of city leaders across the country are attempting to address income inequality and expand opportunity through measures like increasing the minimum wage. In New York, de Blasio has promised higher taxes for rich families and better services for poor ones, including expanded early-childhood education and affordable-housing developments. Americans Are Racking Up Debt Again. Should We Be Scared?